It’s been a fantastically busy month for the NLH Education Outreach Officer as her promotional efforts have really started to bear fruit. 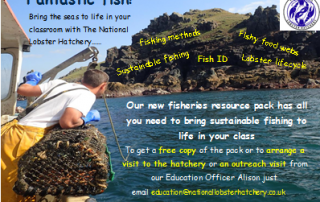 She have been visiting schools and educational groups all over Cornwall, complete with eye catching flyers; which have been handed out in person to the teachers. The personal touch tactics certainly are working and they have resulted in much interest generated for the Fishereis Education Outreach workshops. One of our busiest weeks saw Alison conducting workshops with 8 educational groups; totalling almost 200 children and young people! There have also been some further invitations to interesting external events; The English Surf National Championships and The Fowey Festival Family Fun Event at Trenython Manor to name a few. We are now looking forward to meeting even more enthusiastic youngsters (and adults too!) 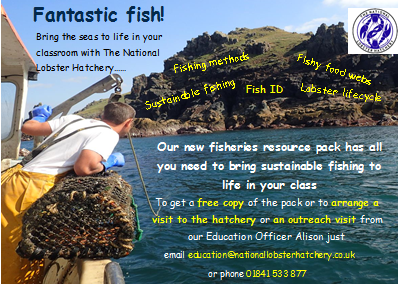 who are keen to learn about the fascinating life of lobsters and why they are so important to both the Cornish and UK economy.